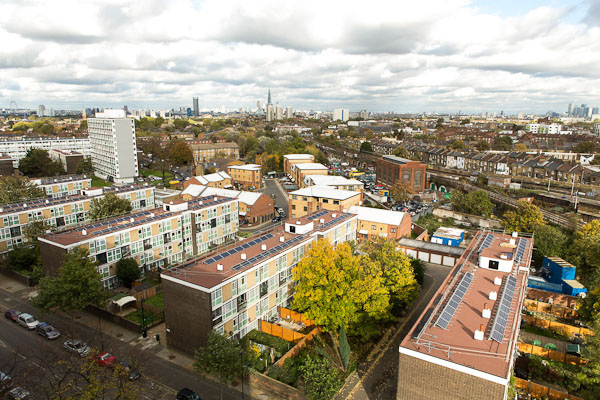 Our second project, Brixton Energy Solar 2, saw the installation of 45kW of solar electric (photovoltaic) panels on the roofs of Styles Gardens, five of the housing blocks in the Loughborough Estate, Brixton. The combined array will save approximately 16 tonnes of CO2 every year by displacing electricity generated by coal and gas power stations. Funding was raised through a community share offer, with an expected average annual return on investment of 3% and up to 50% tax relief under the Government’s Seed Enterprise Investment Scheme. The Estate is owned by Lambeth Council and managed by the Loughborough Estate Management Board (LEMB). We secured approval from Lambeth Council to install solar panels on the roofs following multiple consultation events with the residents of the estate in June and July 2012. We intend for some of the electricity generated from the solar panels to be used by LEMB directly to power the communal spaces in Styles Gardens. The remainder of electricity generated by the project will be exported to the National Grid. The electricity exported to the Grid will be used immediately by any household or business that has a need for electricity at the time the electricity is available. For instance, at the height of summer when the panels are producing their maximum output, the project will be producing the equivalent of enough locally-generated solar power for over 70 households on the estate. Unfortunately, it is not possible to provide a direct supply of electricity from the project to the flats in Styles Garden because they are metered individually. However, we intend that these households should be the first beneficiaries of the social fund generated by income from the project, with initial emphasis on draught-busting, other energy efficiency improvements and education initiatives.